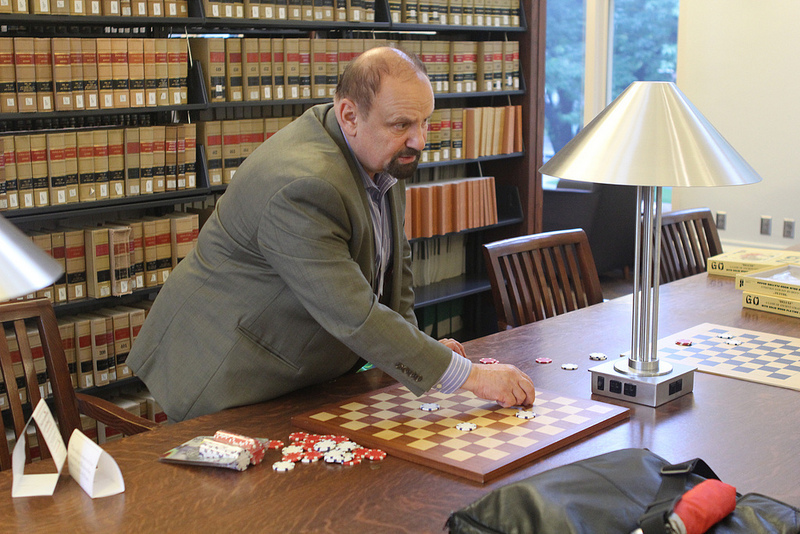 Master players of chess, bridge, poker, Go, and international draughts convened at Harvard Law School on June 13 to discuss how such “mind sports” might enhance learning in schools and libraries, and even contribute to building civic life in communities “with an Olympic vision.” The daylong conference, “Bringing Mind Sports into the Classroom and Beyond,” drew 24 invited participants from the education and library worlds as well as the game masters. Anthony Holden, author of Big Deal, a 2007 book on his life during a year as a professional poker player and first president of the International Federation of Poker, moderated the first session of the formal program, a series of “lightning talks” by the masters of the games. Andy Okun, president of the American Go Association, countered that although Go might be a game of complete information, “there is no way to exhaust all the possibilities,” and that a player who launches an attack doesn’t necessarily know if the opponent realizes what is afoot. He showed how one can teach Go to beginners, including children, with a 9 x 9 square board instead of the standard, but more intimidating, 19 x 19 board. He described an animated cartoon, about a teen who contacts the spirit of a deceased Go master after finding an old board in the attic, as another way to interest young people. International grandmaster Maurice Ashley called chess “a game of geometric relationships, dramatized.” He noted that the chess pieces move in ways consistent with Euclidean geometry, and that “you have to make all these geometric relationships work together. You can destroy the other person’s pieces with your heroes of linearity.” Chess teaches “concentration, problem-solving, the need to think before you act,” he said, adding that chess has done a good job of getting into school systems; a New York City chess-in-the-schools program, for example, has served 400,000 students since 1986. One challenge poker encounters, Holden said, “is the perception that poker means gambling.” In fact, he emphasized, there are 60 million to 70 million online poker players pursuing the game with no money changing hands. McManus and others are advancing the cause of (non-gambling) “duplicate poker,” tournaments in which hands are pre-dealt and so all players have a chance to show their skill holding the same cards.